Experience Boonah’s strong community spirit at the 2019 Boonah Show, where there’ll be something for showgoers young and old. The theme for the 2019 Boonah Show is “Showcasing our Farmers”. This is very appropriate for this year, our Farmers are struggling with the drought, and attending the Boonah Show is one way to show them your support. Enjoy yourself over two big days from 31 May to 1 June, 2019. There’ll be the judging of cattle, horses, goats, poultry, horticulture, birds, fruit and vegetables, school work and photography. Get your thrills on the rides and sideshow alley attractions, tuck into some hearty show food and enjoy entertainment for the whole family, including the grand parade, chainsaw races, ute muster, demolition derby, woodchopping, dog shows, machinery displays and fireworks. The highlights of the show each year are the judging of horses, cattle, poultry, goats, horticulture, birds, fruit & vegetables, photography, schoolwork, and much much more. Entertainment favourites include a great variety of rides, sideshow alley, food and merchandise., the demolition derby, cavalcade of transport, chainsaw races, ute muster, motor cross bike challenge, young farmers challenge and of course the spectacular fireworks. There is also the popular celebrity chef competition, hay stacking competition, pet parade and for the kids there is the ever popoular lego competition. Management and Committee Members are nominated members of the Show Society. 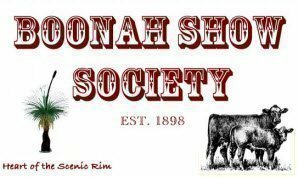 Members subscription for the Boonah Show Society Inc is $20.00 per person per year. Upon production of their Membership ticket, members are entitled to free admission to the Show on all days. This does not entitle members to a discount on entry fees. • Restricted parking only on Showgrounds. • All Caged Bird, Poultry & Pigeon Exhibitors must obtain an Exhibitors’ Car Pass from the Show Office to park their car on the Grounds. It will be forwarded on receipt of Entry Forms. • Free Parking on Soccer Grounds – entry via Elizabeth Terrace, behind Squash Courts. Direct Gate access to Showgrounds. • Horse Exhibitors’ Parking on High School Oval, Macquarie Street. • Livestock Exhibitors must park in their designated areas. The lucky gate prize will be drawn at the Boonah Show at 7:30pm in Centre Ring. • Redeemable between 3rd June - 15th December 2019. • Donated by Airsport Qld.